Made this birthday cake for one of my extended family members. It's her birthday today. 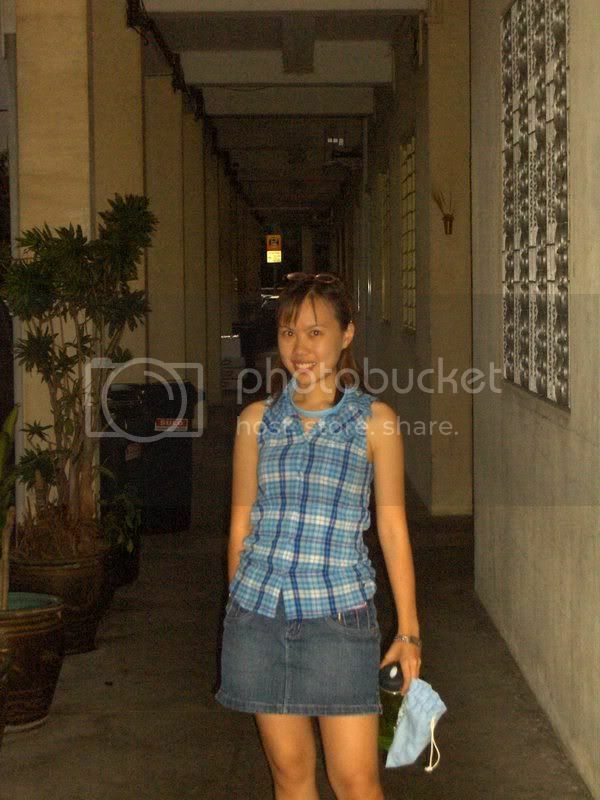 It's gonna be a very special day, since it's 07-07-07 today! I used the same sponge cake recipe which I have been using where 4 eggs are beaten with sugar & some salt. It is important to leave the eggs at room temperature before beating. I'm not sure why, but I think the eggs are easier to whip at room temperature. By the way, this photo was taken with my left hand holding the mixer and the right hand holding the camera. Beat the egg mixture at the highest speed of your electric mixer...and it'll probably take about 8 ~ 10 mins to reach the ribbon-like stage. Can you see the "ribbon" formed on the batter? Fold-in the sieved flour gently...do this by lifting the batter with a spatula from the bottom of the bowl and turning the bowl at the same time...it's kind of hard to describe this part...just make sure not to deflate the batter too much. The batter will look a little lumpy at this stage. Pour out about a third of the batter and mix it in a separate bowl with the salad oil. 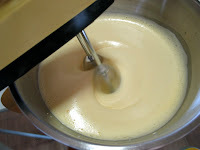 Then combine the mixture with the remaining batter. This method helps to prevent the batter from being deflated too much when you mix a denser liquid like oil with the batter. 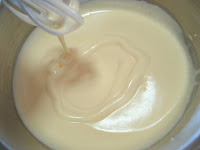 This is how the batter looks like when the salad oil and then milk are added. The mixture should look smooth now. Pour batter into an 8-inch prepared pan (lined with parchment paper) and it should be about 70% full. Slightly lift up the pan and gently give it a few "bangs" on the table. This will help to release some of the air bubbles trapped in the batter. It's so interesting to see how the cake bakes in the oven. If you stand in front of the oven long enough, you will notice that there are actually 3 distinct stages of the baking cycle. 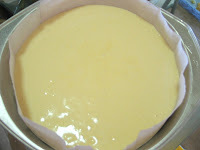 During the initial baking time, the batter will appear to sink in the middle of the cake pan. Subsequently, it will inflate and rise up above the baking pan (as shown in this photo). Eventually, when the cake is almost done, it will shrink back to the height of the cake pan. Interesting, isn't it?? Here's the sponge cake that was baked to a nice golden brown. I read from somewhere that the cake should be cooled inverted. This way, the top of the cake will be very even. It's so satisfying to look at a nice, evenly baked sponge cake. I thought it looks good enough to be eaten plain. 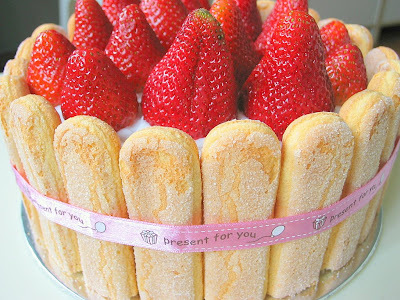 Finally, after lining-up the ring of sponge fingers, I covered the top with strawberries. These strawberries are quite huge...as a result, the cake was a little too tall for the cake box I bought...I couldn't even close it properly :( I got to secure the sponge fingers with a ribbon as I was quite sure they would fall apart during the delivery. Fortunately, the cake was delivered to the birthday gal in good condition. This is another pretty piece from you! Keep up the good work! i love yr well risin sponge cake as the sponge cake i bake always fall flat once taken out from the oven. Btw did u also line the bottom of the cake tin with baking paper. Was the cake imeadiatelly inverted once taken out from the oven or should i wait for it to cooled down. May i kindly know what size of eggs do u use example how many grams in an egg. I usually use 62gm of egg. I read that its better to use AA egg which is like 72gm but its dificult 4 me to buy AA eggs. Looks delicious! Mango is my favorite fruit! 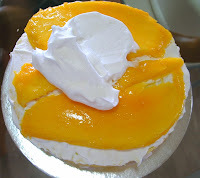 The only thing I might change when making this myself, is I'd cut the mango into smaller pieces so when cutting the cake you don't have to worry about not being able to slice through the mango as easily as everything else. mmmmm! can't wait to try it! yes, I lined both the sides and the bottom of the pan with baking paper, so that it is easier to remove the cake. I let the cake cool in the pan for just a couple of mins (not more than 5 mins, i think) and then inverted it on the wire rack. Tks so much for the step-by-step instructions with photos, I feel more guided when attempting this recipe. But I hv not bought a cake mixer yet, could u pls tell me which brand/model u use (or what u would advise me to buy in terms of specifications like wattage/handheld or stand type etc..) and is yr oven convection (can fan be turned off)? I was goingto do the durian muffin this weekend but was dragged to Shenzhen for overnight.....sigh, it will hv to be tmr or Tue b4 I can attempt my muffins. Tks so much again. Like you, I love cookbooks that comes with step-by-step instructions with photos...it really helps for novice baker like me. I tried to take such photos, but sometimes it can be quite tricky to be the baker and photographer at the same time! Sorry, I am afraid I can't give you advise on the type of mixer to buy...mine is a very old handheld...at least 20yrs old, no brand. Well, I think it all depends on your preference, budget, kitchen space...and whether you will be using it very often. Maybe for a start, you can get a handheld mixer, if you are not sure whether you will "sink" into this hobby? You can then slowly acquire other items down the road. but do beware, baking is a very addictive hobby! btw, can you get durian easily in Hong Kong? Looking forward to hearing from you on your muffin attempt! Happy Baking! When using mango in cakes it would be good if you slice it in cubes and if you want to add more flavour to your cream you can add some mango puree as well. Although if you do so, I think it would be wise to add some gelatine to stabilize the cream. Hihi, your cake looks so beautiful! And your step by step illustration is very useful too. hey vb, I am still relatively new in baking...there are just so many things to learn and try! Hello, it sounds like you're making a genoise cake instead of a sponge cake :) A genoise cake relies solely on the air generated during beating to rise, while a sponge cake uses baking powder. The cake looks delicious! I really like ur milo doggies! Do u think it's ok if I used horlicks instead of milo/ovaltine/vico in the milo chocolate chip muffin? And for ur oreo butter cake recipe, do u think it's possible to replace oreo cookies with munchy's muzic wafer cubes? (I have many wafer cubes laying at home!) Will the wafer cubes turn soggy? Any other ideas on what other cookies or biscuit I can replace oreo with? Guess what??!!!! Made banana blueberry (BB) & dur... Guess what??!!!! Made banana blueberry (BB) & durian muffins following yr recipe today and I would say it was a success for a first attempt!! OK, I should not hv cut the sugar in the BB muffins coz I was worried it would be too sweet since yr kids like them and in my experience, I find that kids always like super sweet stuffs. So when I did the durian, I followed exactly the sugar amount but alas, got too excited with the durian (very tiring to seive durian pulp ok! Hands numb liao!) and I didn't know what to expect so wondering why left hand feels so wet (right hand mashing with fork) and so I looked......gosh, kerna durian everywhere!!!! Then when filling in the paper cups, yes, yes, I know do not over-fill or under-fill but decided more durian pulp shiok...so got carried away and as u guess lor, got durian lava over-flowing when baking!!!!! If u like to hv a look at the photos for them, I can email u if u give me yr email address or u can email me first. Baking is so so tiring.....way more tiring and stressful as compared with cooking......now must rest for a couple of days liao!!!! Tks so much for the recipes and advice......will be back to try more of yr recipes when I get my mixer. hi lousy baker, I got the sponge fingers from Carrefour (Plaza Singapura), you can also find it at some NTUC branches. The brand is something like Vicenzi (sorry I threw away the package, didn't really know the actual spelling!). The packing is in light orange, around $2.70 ~$3 a pack. I got the ribbon from Daiso...actually should use a ribbon that is broader in width, I think it will look better, what do you think? hi Hazel, yes you are right, it's a genoise actually ;) Just that the cookbook I used is in Chinese and it used the term sponge cake. This is quite a good recipe as the cake is rather moist not overly dry. hmmm, I am really not sure whether you can replace oreo with wafer biscuits for the butter cake...personally I think the wafers will become soggy or dissolve into the cake batter?? I can't think of other cookies to replace, maybe you can try those biscuits that are hard or have similar texture like oreo? chipsmore? or those traditional biscuits by kong guan?? 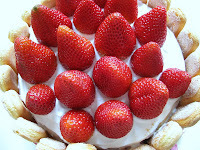 Hi... this is the 1st time i come across your blog and wow.. you had a lot of baking ideas.... 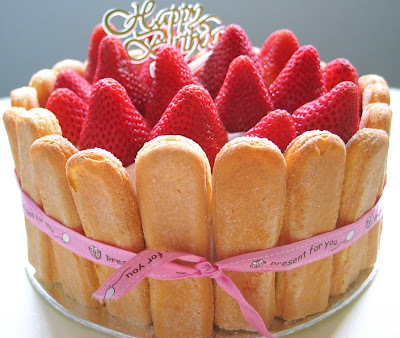 I love our Mango Strawberry cake and milo doggies cookies...they are so nice and cute... And i must tell u, your cake really look great and creative.... Jai You... ! Hi your cake looks so cool and makes me drooling. Love the way you take all your foods shot. Clean and simple. Thanks for your step by step method and it is very useful. Keep up the good work. What a fabulous cake! It looks so beautiful! And I love the step-by-step photos, too. Hi Ellena, thanks for your compliments! 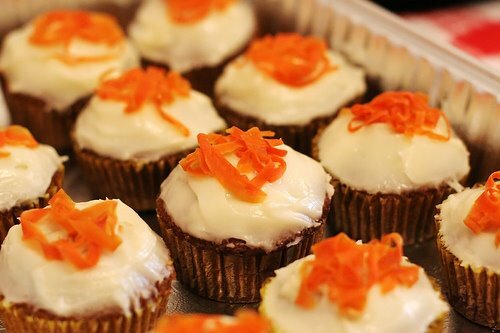 I have been reading your blog regularly...I really admire your cooking and baking skills! hey sue sue, thanks for visiting! Glad you find the step-by-step photos useful :) but must say, they are not very well taken! 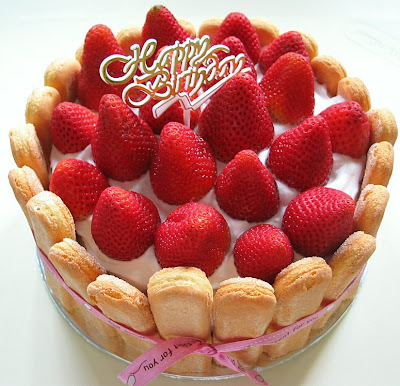 Hi Happy Homebaker,ur cake look fabulous & delicious.Really hope i can make one. 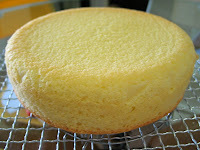 i always has difficulty in making sponge cake.can u give me some advise? And i cant get cake flour from m'sia? can i use self raising flour or superfine flour? Hi aNn, for this sponge cake, the whole eggs are beaten together...ie beat both egg yolks and egg whites together. 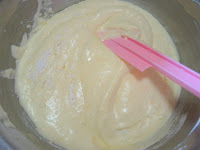 I have not tried beating egg white yet...the method that you have mentioned is usually for making chiffon cake. As for the flour, do not use self raising flour as it has baking powder added...for this sponge cake, no baking powder is required. 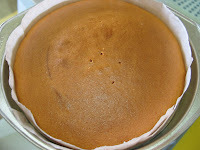 I am not sure about superfine flour, but if you can't get cake flour, you can use Top flour which is usually used for chiffon cake. You can refer to this site (www.prima.com.sg) for the use of various types of flour. tq happy homebaker,i hav bake sponge cake using ur receipe.its vy nice.much better than wat i baked b4..thanks for ur receipe. but ur receipe using 4 eggs is suitable to make 18cm cake. how if i wan to make 25 - 26 cm cake? can i use 5 or 6 eggs? but how to adjust other ingredients?can u pls advise? hey aNn, great to hear that your sponge cake turns out well! So, you managed to get Top flour or cake flour? How's the texture of the cake? Happy Homebaker,vy kind of u to calculate the ratio for me. For the sponge cake,i cant get Top Flour or Cake Flour but i found from other blogs n website mentioned that every 100g Cake Flour, we can use 80g Plain Flour and 20g cornstarch.So for ur receipe,i used 100g Plain Flour and 40g cornstarch. ;) The texture is fine & light. Tq for ur receipe. This looks stunning! It's amazing how you can balance a mixer in one hand, and a camera in the other. As an amateur, I really appreciate the step-by-step photos. I've always wanted to try baking a sponge cake, but never had the courage to, because of the sponge-failed-to-rise stories I hear. Thanks again! This cake is pretty! I liked it very its blog. I can include its blog, in mine blog also? Until soon. Hello!Im just wondering if u can substitute cake flour for optima flour... and if i make use of top flour what will the texture be like? Oh n whats salad oil? Issit olive oil? Hi Mel, I am not sure about optima flour as I have not used it if before. Top flour is fine, as cake flour and top flour are almost the same. As for salad oil you may use olive oil, or sunflower or canola oil, hope this helps. hi homebaker, ur sponge cake itself looks very tempting! i don't have an oven at home and am thinking of getting one, maybe a conventional oven which can bake as well. Do you have any recommendation? any brand? budget of less than $150. i cant have one fixed at the stove because of space constraint. Si Im looking for one that i can keep aside when its not in use. I appreciate any recommendation! thanks!! Hi Anonymous, I am afraid I dont have any recommendation as it really depends on your preference and budget. You may want to shop around before deciding which brand to get. I am using a Tefal oven, stand alone, which I put away after each use. Wow!!! Good job. It's really nice. I cannot bake cake at home, so what i can do is -- make pancake & filled with chocolate foster/cream with fruits for my friends & family. But always has problems with how to cover the side way. Hi Rabbit, if you have beaten the egg mixture until ribbon-like, and double/triple the volume, the beating should be done correctly. The next thing will be the folding in of the flour...did you fold in correctly. You will have to use a spatula or a big metal spoon to do this, otherwise the egg mixture will be deflated...and next is the folding in of the oil...did u do that in 3 separate addition? and did you manage to fill the pan till about 70% full? if assuming u are using the correct pan size? You can measure the pan size by measuing the bottom of the pan...the diameter should be 8" (20cm). If the above steps are all done correctly, it then due to the oven temperature. Does your oven gives you accurate readings? Mine dont, so I have to use a oven theremometer. I guess the temperature was too high for your case...that's why the sides were hard. You could have over baked it too. What about the type of pan u use? If u are using those non-stick type, you may have to lower the temperature, as these type of pan tends to conduct heat faster. I use an alum type. These are the factors that I could think of...do let me know if you have any other info to add on, so that I can help find out what went wrong. Don't get upset over it...it's the failure that helps you to learn. Pratice makes perfect. I am sure you will come up with a great cake in your next attempt. i tried baking the sponge cake yesterday and it turn out well except the cake was a a bit dry and texture look a bit rough.Can i know what causes that? thank you for the advices above! i have more questions thou. how do i know if the egg mixture is deflated? how does it look like? I noticed that there are alot of bubbles after i fold in the flour. I was gentle when folding in the flour, is it common to see bubbles? I took out 1/3 of the egg mixture to add in oil and then pour it back to the remaining 2/3. Is that the correct way or i should have add oil to EACH 1/3 of mixture? Assuming my pan is bigger than 8", my cake should still come out soft and fluffy given some adjusment to the temperature and baking time right? I dont know if my oven give accurate reading thou... where can i buy an oven thermometer? Sorry for sooo many questions. Hi Anonymous, I am really not sure what went wrong? maybe you could have over bake the cake a little? as I am no expert in the area of baking, my knowledge is as limited...hope u don't mind. i tried baking this cake once again using the receipe with 206g sugar and it was a success! im so happy! the batter was real fluffy and thick and creamy and i had a good feeling abt it. i baked it for 30 min and it turned out very well except for the surface that breaks a bit and is alittle too brown. other than tat all fine! comments from my family is tat its too sweet but becoz i have put mango, its not too bad. i wondered wat happened... last tried i used 100g sugar but the cake was a total failure. Could the amount of sugar matter? Hi Rabbit, I tried with both 200g and 100g of sugar, and the results were the same except for the sweetness. I think the addition of sugar helps in beating up the eggs to double/triple the volume. could it be possible that the first time you tried, the eggs were not beaten well? i thought so too! the mixture of eggs and sugar this time rd was very nice. i shall try the 100g sugar again this wkend. Thanks for your advices! Looking forward to more of your cakes! hi happyhomebaking, i must thank you for sharing your wonderful recipe and the step-by-step pictures really help as this is the 1st time I'm baking this type of cake. However, the sponge cake did not turn out as fine and soft, i suspect i'm still no good in the folding method which poses quite a challenge for me. I'm going to try harder the next time! i've tried a few of your recipes esp the chocolate gateau. the ganache is the best! Hi Rebecca, yes I line the base of the pan by cutting a circle, and grease and flour the sides. Sometimes, I will line the sides with paper too. I just found a webpage which has got good illustrations on how to line a baking pan (http://www.akiskitchen.ca/techniques/greasing_cake_pans/grease_pans_1.html) Hope you'll find it useful. Hi JIAYI, I usually get strawberries from nearby HDB shop fruit stall, and sometimes from NTUC. Hi Vivian, thanks for your suggestion. I can't really make a video as I can't rely on my kids to take a good video clip for me. I did once when I was making a swiss roll in the end I had to do a lot of editing! You can take a look at the video clip, under the category "Links to My Video". 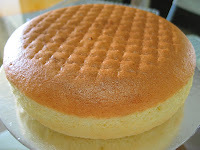 The method of making the batter is exactly the same as making the batter for a sponge cake. Hi Anonymous, the recipe is posted under the post "Peach Layered Sponge Cake". Hi ellavu, the ribbon is from Daiso and the tag is from Phoon Huat. thx :) n lady finger can buy in Fair Price??? Hi ellavu, you can get the ladies fingers from cold storage or carrefour. What a pretty cake !! and i love your blog site. I was trying to make the same cake yesterday but not successful. Everything was going fine with the batter, till I put in the salad oil, the batter deflated. I have already separate one third batter to mix it with salad oil first. Any suggestion ? Can i leave out the salad oil ? Hi Anonymous, I am afraid you can't omit the oil, otherwise the cake will be too dry. You will need to use a spatula to fold in the oil to the batter. Maybe you can look at video clips (from youtube) to have an idea how to go about doing it? hey happyhomebaker, i've been a follower of your blog, and love baking myself too. the unfortunate thing is, i don't have a proper baking oven. i use those convection microwave oven that allows baking too. i always wanted to bake a proper layered bday cake. i tried this sponge cake recipe from your blog but failed. i realise the methods (plus ingredients used) of doing it is almost the same as the nutella swiss roll recipe. and the result i got was also the same as when i baked the swiss roll. 1. It doesn't rise well, in fact it only rise A TEENY BIT. 2. The texture is very COMPACT, not soft nor fluffy at all. 3. I couldn't achieve the ribbon-like stage, i don't know if i've missed it and over whipped. 4. When i mix in the flour using the spatula, the mixture just don't look as smooth as yours in the pic, there seems to be bubbles too. Hope you can give me some advice on this. Is it because of those mistakes i made above? and how much do u think its because of my oven? and btw, how do u exactly line the cake tin so nicely? and when do we actually need a cake tin with removable base? p.s. sorry for sooooo many questions! Hi Chloe, thanks for your support! I think you didn't beat the eggs and sugar mixture enough. First bring the eggs to room temperature if they are kept in the fridge. 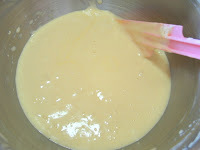 When you whisk the eggs and sugar mixture, initially it will be very 'watery' and bright orangy/yellow. Use LOW speed for the initial 1 min, then turn to medium-high and beat for about 5 mins, the mixture will start to thicken and turn pale. The volume will have doubled/tripled by now (if not beat for another min or so). Turn to LOW speed and start checking every min. Lift the paddle up, use it to 'write' a number "8". if the trail doesnt disappear by the time you finish writing, then it should be the correct stage. To help fold in the flour, sieve it 3 times before using. When adding in th flour, sieve over it onto the batter in 3 separate additions. Initially after folding in the flour, the batter will look a bit "rough" but after adding in the butter it will become smooth again. I am not sure about your oven, but for your case, I suspect it is the incorrect beating of the eggs. If you are able to achieve the above, you should be able to get it right. To line the sides of a baking pan, you can cut a long strip of parchment paper (use two strips if not enough to cover the entire circumference of the pan). The width of the strip should be about 2cm bigger than the height of the pan. then fold in about 1 - 1.5cm along the length of the strip. Use a scissors, make diagonal slits (about 1" apart) along the folded length of the paper. Place the strip on the side of the pan, with the snipped part on the bottom of the pan. This way, the sides will be lined nicely. Hope you understand what I mean. 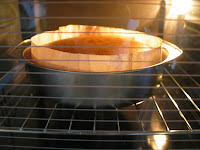 You will need a removable bottom pan if you want to make mousse cakes or cakes that you cannot invert when you release it from the pan, eg a Charlotte cake or no-bake cheesecakes. thanks for the detailed explanation! really appreciate, i will try the "beating eggs" stage again. but today i'll try the milo doggies first(: thanks alot! Is salad oil the same thing as canola oil...if not, could i use it in place of salad oil? thank you soo muchh !! Hi NomNomSushi, yes, salad oil is just another term for vegetable oil, you can use canola oil. I am not sure what is a cheesecake pan? I used a normal cake pan. oh, they're also called "springform pans"
did you use Cold eggs? you will have to make sure you leave the eggs on the counter so that they are brought to room temperature before you start to beat them with the sugar. Did you use caster sugar? maybe you can try with medium to high speed (dont use the highest speed) the next time...stop when you feel that the mixture turns pale, becomes thick but still can flow easily...turn to low speed and continue to beat until the ribbon like stage. the sponge cake recipe of yours! following your steps very precisely! the cause is for this? Hi Ice Pandora, I am not sure what went wrong, but maybe you didnt beat the eggs(room temperature eggs) and sugar till the mixture thickens, triple in volume and leave a ribbon like trail? if u have done this step correctly, then it could be the folding of the flour into the batter. You could have deflated the batter. The finished batter should be thick and not thin and runny. Or, it could be due to the oven temperature? You could have over bake it? the salad oil and fold it well. Ice Pandora, looks like you have done every step correctly. I dont think that extra 5 mins would affect the cake too much. I hope you have better luck next time, or with other recipe. cheers! after the egg beat til wat stage then it should be turn to low speed to beat it?for the 4egg recipe choose a big spatula wil be easy to foldand prevent it from deflate that much isit?folding in the flour when fold the first batch dun have to fold evenly then begin sift in the second batch and fold it?when the egg become fluffy wil it be stil got bubble there? Hi, turn to low speed after the ribbon-like stage, beat for about 1 to 2 mins to stablise the air bubbles. Use a bigger spatula for folding regardless whether it is the 4 eggs or 3 eggs recipe. When folding in the flour, fold until all the flour is fully incorporated after every addition. Sorry, I am not sure what you meant by 'egg become fluffy'? your cake is really nice. thanks for the step by step pix. May i know where did you buy the sponge fingers? Hi, thanks for your comments. I got it from local supermart. Can i check if you have the recipe for the basic sponge cake but 9" instead? Hi J, I do not have recipe for 9" cake.